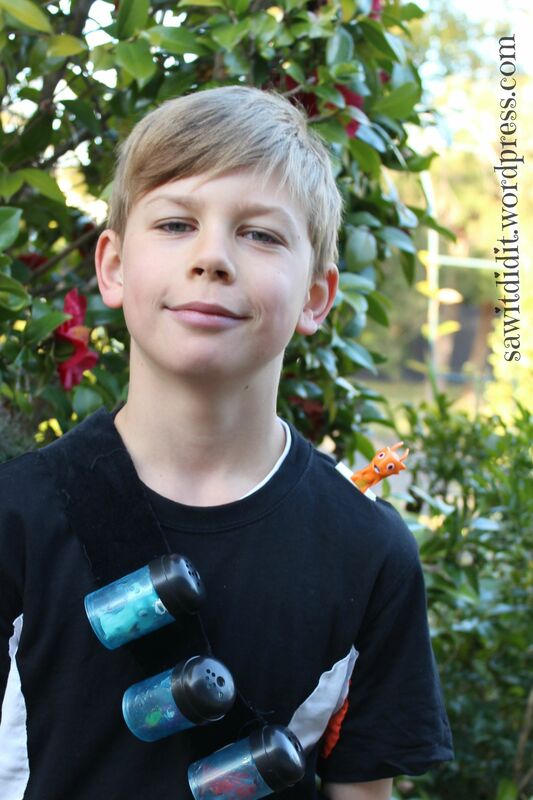 Book Week | Saw it, Pinned it, Did it! Even though we had decided some weeks ago to be Eli Shane for Halloween, and I had dutifully scoured Pinterest for inspiration, I only started the costume the day before. I was a bit nervous! And perhaps rightly so, since creating the t-shirt took me several hours and a couple of re-dos. But my very happy young son was so impressed when he saw it, and hasn’t taken it off since! You can find my Halloween Pinterest board here. Earlier this year the boys discovered a computer game during free time at school – Slug it Out, based on Slugterra. Shortly after, the show appeared on television. Don’t ask me what time or what station…! Anyway, suffice to say that Eli Shane is the current ‘hero’ of choice. Here he is: To make the t-shirt, I started with the idea from http://toneeprojects.blogspot.com.au/2013/10/eli-shanes-shirt.html. 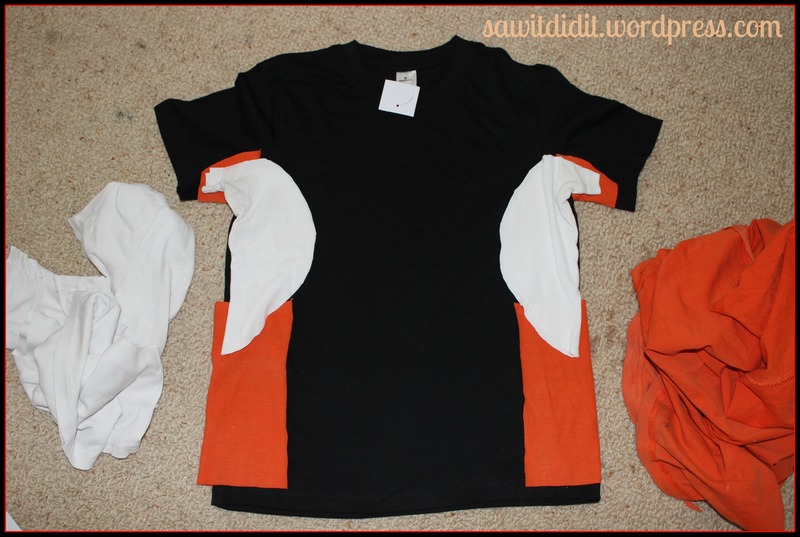 However I didn’t cut up the original black shirt, I just attached appropriate bits of white and orange. 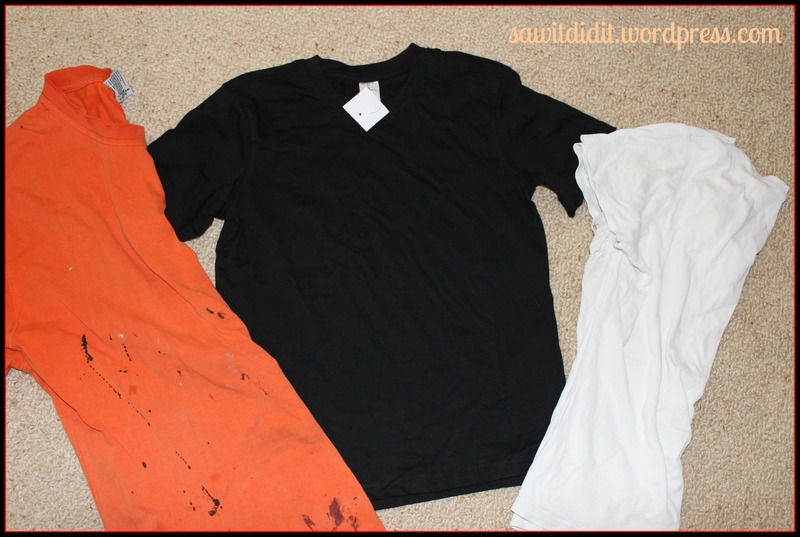 I found a couple of old shirts that were due to be used for rags. The black t-shirt I bought specially for this project. It came from KMart and cost $3. 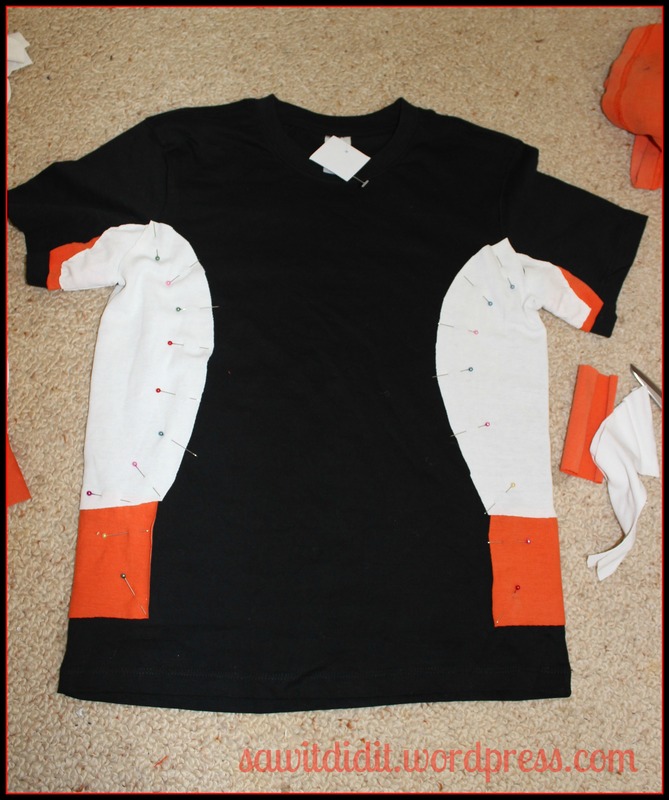 My first thought was to just cut the armpit bit out of the white shirt and sew it onto the matching spot on the black shirt, along with bits of orange. But the angle of the sleeves was completely different and it wouldn’t have been a smooth join. I am no sewing expert, so if there is a simple way to do this I wouldn’t know! This was nearly the time I gave up, but I thought and thought how a basic sewer like myself could come up with a solution. Which I did. I ended up cutting 2 separate pieces of white, one bit for under the arm, the other for down the side. Next up was the slug holders. I found a pack of toothpick containers at the cheap shop for about $3 which did the job nicely. 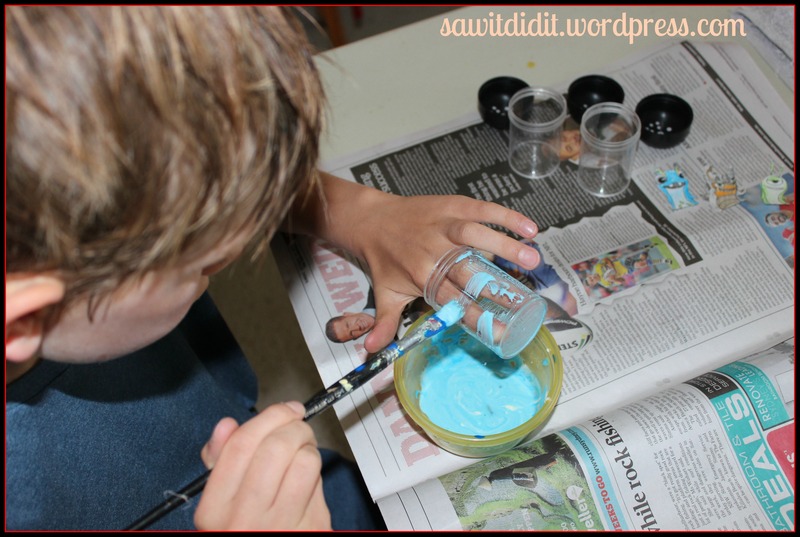 Following the idea from http://lifesprinkledwithglitter.blogspot.com.au/2014/08/diy-slugterra-costume.html I mixed some blue paint with glue and painted the containers. The painter was a little heavy-handed with the paint so they dried with some big drips, but that is ok. He has a large collection of slug drawings, some of which he did himself, some he downloaded (just Google Slugterra colouring pages) and coloured in. You can see the 3 he chose in the top right of the photo above. 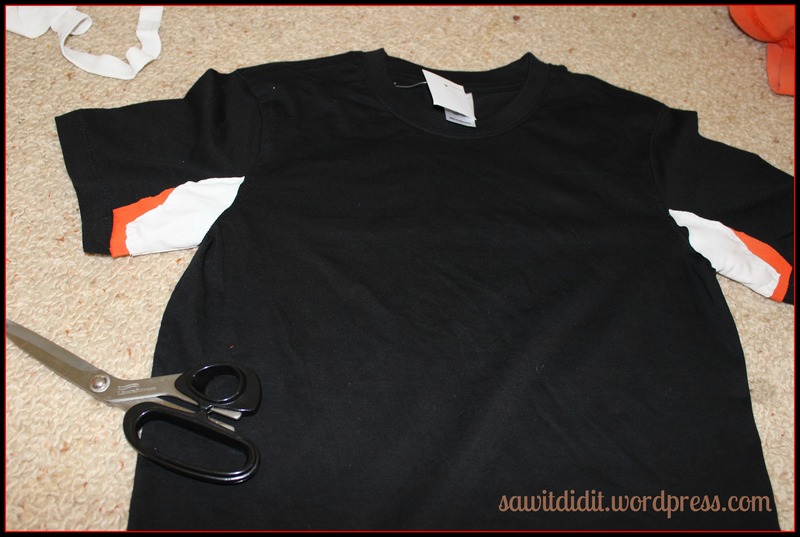 I cut a piece of heavy black fabric and the containers were attached with some heavy duty adhesive. I didn’t bother hemming, and it is held together with a safety pin. 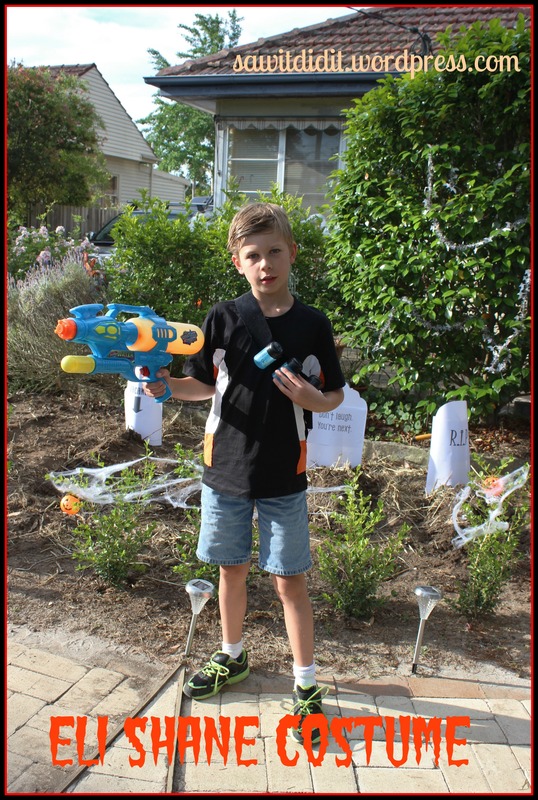 For the photo he used an old water pistol, but it wasn’t authentic enough and he couldn’t be convinced to take it with him. You can see he’s a little happier in the second photo without the water pistol and with the extra slug! Yesterday was very hot, so there was no way he was going to wear long pants and boots. Definitely shorts weather! 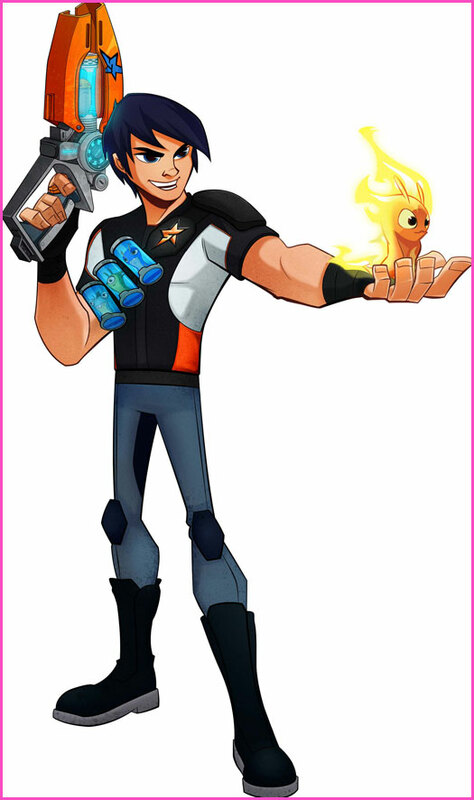 Are you a fan of Slugterra? 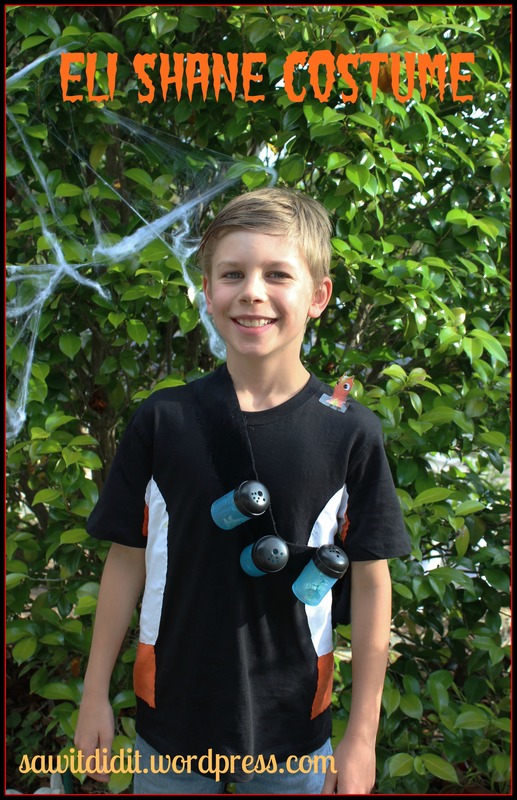 Today was the Book Week Parade, and so this costume came out again. It had lasted fairly well, it has even been washed! Since it is Winter here now, the top was teamed with black jeans. Today was thankfully a beautifully sunny day and not too cold, but there are still a couple of layers under the black top. We didn’t bother with long black boots. Or slicking back the fringe. The only other update to the costume was that we now have a set of slug characters which I bought on eBay at the beginning of the year. So the paper cut outs in the slug holders were replaced with these characters. And of course, Burpy had to be sitting on the shoulder. 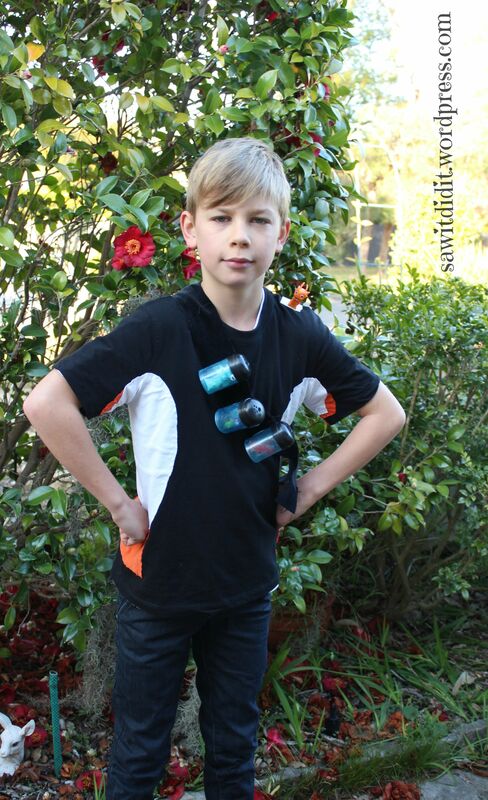 I left that one up to the wearer to work out, and he was very happy to attach him with a roll of masking tape. You can see the tape quite easily, but he wasn’t worried about that. And if it didn’t bother him, it definitely wasn’t going to bother me! I wonder what the next costume we’ll have to create will be?